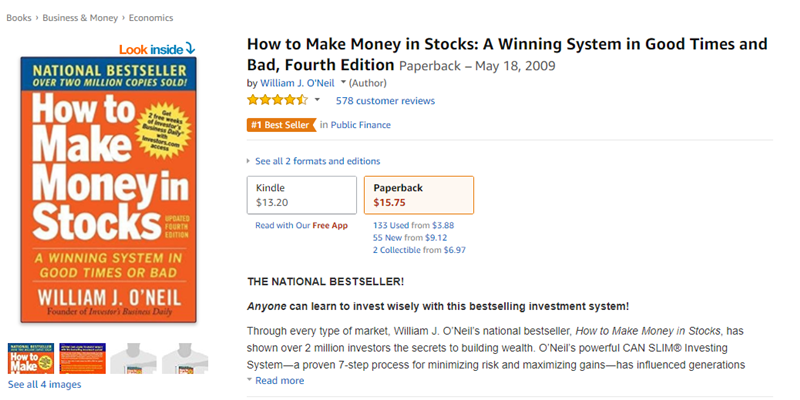 If you are serious on investing, you would have probably come across William O'Neil's book, How To Make Money In Stocks : A Winning System In Good Times Or Bad. William O'Neil has probably done more in educating people about investing in stocks than any other educator. His books have sold by the millions and his website www.investors.com is a very popular online investing website. Furthermore, his investing newspaper called Investors Business Daily has been the staple food for many investors for decades. In this article, we will have a look at the legendary book "How To Make Money In Stocks" and see if it suits you. This book is more for people who like to invest, so if you are looking to find a book on trading then it may not work that well for you. 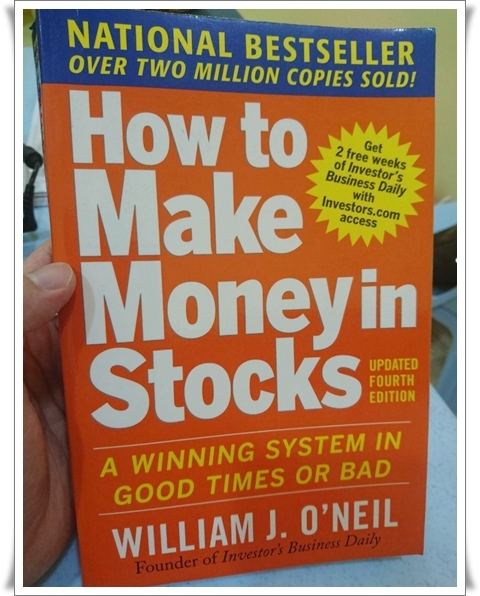 This book written by William J. O'Neil is one of those books that changed how I approach stocks. It opened up my eyes on how proper investing should be. You should choose growth stocks that have great earnings that revolutionizes the world with their products. That is the key theme to this book. How To Make Money In Stocks teaches you to find the next Apple, Netflix, Microsoft, Facebook and Google. Inside the book, you will discover the method to find these stocks. The above is a picture of my trusty 4th edition of this book which I bought many years ago. I think by now it will have been in the 5th or 6th edition. This is a very good book that will teach you step by step on how to do fundamental analysis and find great growth stocks. It's not only me who thinks that this book is very well written. The majority of people who buy this book on Amazon also thinks that it is a great book. So you definitely want to check it out for yourself. The above is a screenshot of the book review on Amazon.com Out of 578 customer reviews it got a 4 and a half star. Something that gets that rating on Amazon is definitely worth checking out. And as you can see, it is the no.1 Best Seller in Public Finance. I'm not going to waste your time talking too much about the book at this moment. So, I'll just make a list of the pros and cons of this book right below. Later I will go into more detail into it. In summary, IMHO I believe this book is superior when it comes to filtering companies that have the fundamental characteristics of a winning stock. However, when it comes to technical analysis knowledge, you need to learn it from somewhere else. Thankfully, this website offers you lots of technical analysis knowledge which you can use to supplement the lessons you learn in How To Make Money In Stocks. To be fair to William O'Neil and IBD, they did a great job in condensing a winning formula into a 450 plus page book. You obviously can't put every single knowledge into a book otherwise it will be too thick. Which is why they have a website that supplements the book (and also bring extra business to IBD). In the 4th edition that I have, they actually put in 100 charts of the greatest stock winners from 1880 through 2008. This is quite impressive. I have the 3rd edition and those charts were not present in that edition. You can actually see how the stock chart looks like. 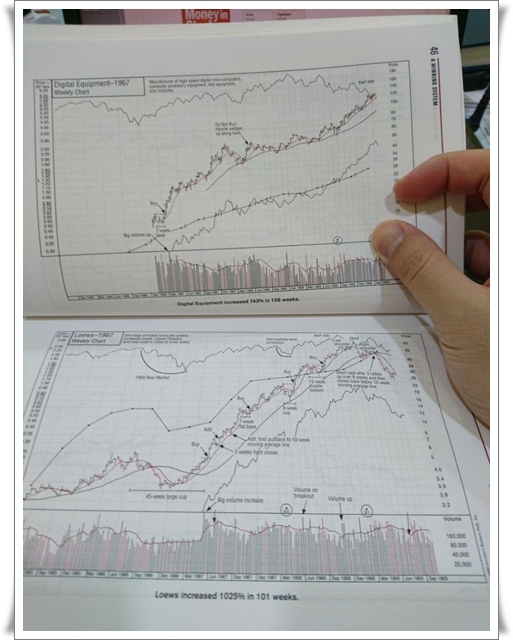 The picture above shows a sample of the 100 charts that I mention. Pretty interesting stuff to study. It's always good to have a look at the charts of some of the biggest winners of a decade. It is even great to look at some of the biggest winners of the year. Doesn't really matter from which country the stock comes from. As long as there are stock charts, you can learn a lot from them. Obviously I won't be going into detail into the CAN SLIM method. I leave you to discover the whole thing in William O' Neil's book. But they do offer you some introductory articles on CAN SLIM on their website. You can check them out at Investors.com articles on CAN SLIM. 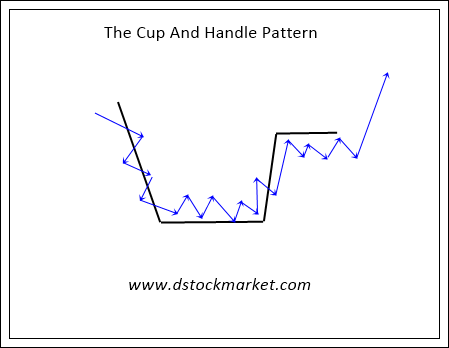 One of the chart patterns that William O'Neil made very popular is the cup and handle pattern. It is a bullish reversal chart pattern and you can often find this pattern in stocks that are about to move up big time. In my own trading, I have found this pattern appearing time and again in different time frames. Seems like it not only appears in the weekly charts. It also appears in the daily chart, the monthly chart, the hourly chart and even intraday charts such as the 5 min charts. So everyone in the market can take advantage of this chart pattern. From investors to day traders. Well, this is what the cup and handle pattern looks like. 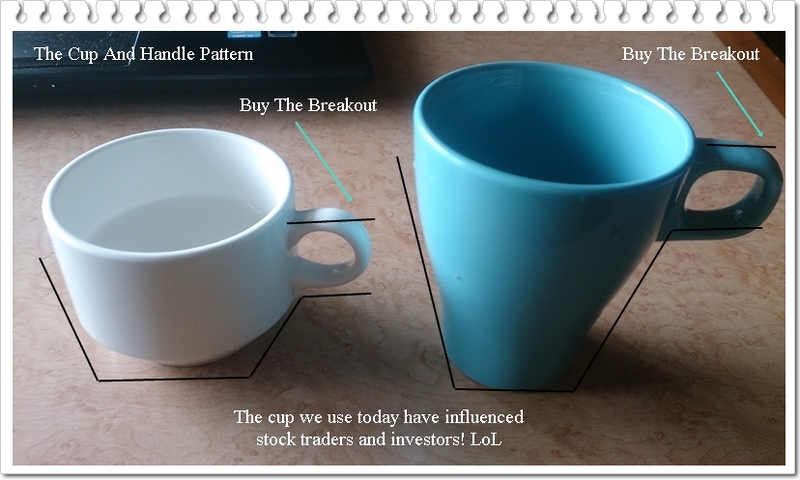 Isn't it amazing how simple everyday objects can be used to identify patterns in stocks? One of the great things that I learned from How To Make Money In Stocks is the concept of relative strength. William O' Neil advises his readers to always choose stocks showing good relative strength. They have come out with a proprietary system and rates stocks with a grade from 1 to 99. Again, you will need to subscribe to IBD's online service to check the RS for each stock. The approach of using relative strength to filter out good stocks makes sense. For example, when the stock market is crashing, the truly sound companies will not fall as much as lousy stocks. Sometimes they do not fall at all but just trades sideways waiting for a breakout. Not only does this work very well to investing. I find that it works very well in trading as well. When the market corrects for a few days, there will be some stocks that will be trading sideways in the 60 min charts. The moment the market finds support and bounce up, the stock breaks out and go higher. I feel like William O' Neil is the Sherlock Holmes of stock picking. After spending decades looking at stocks that have gone on to be big winners, he has collected a big set of "hints and clues" that point us to the next big winner. CANSLIM is the method he uses but littered all over the book are hints and clues and collection of wisdom and observations from the master himself. 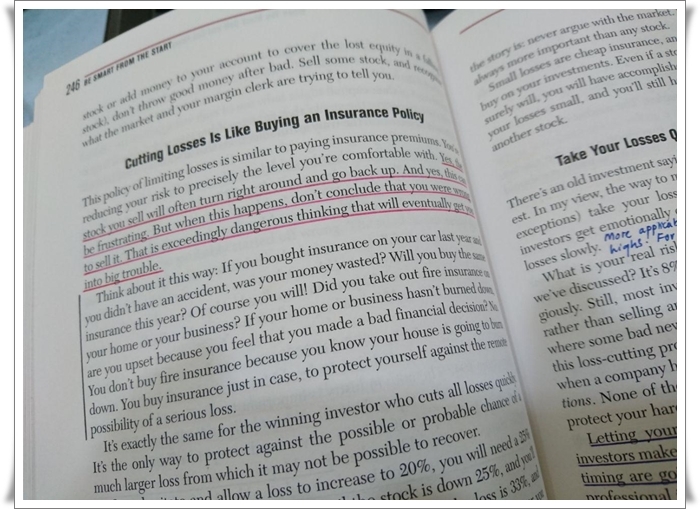 My own copy of How To Make Money In Stocks are full of sentences and paragraphs that I have underlined. I also write my own thoughts and observations in it. We are reading a book by a "market wizard" who has made it in the stock market. Therefore, its always a good idea to underline the wisdom in the book. By the way, William O' Neil is one of the stock market wizards that is featured in the original "Market Wizards" book by Jack Schwager. One of the component in the CAN SLIM method is the M which stands for Market Direction. The book highlights the importance of checking out the direction of major indexes. As 3 out of 4 stocks or 75% of stocks follow the direction of the market, it makes sense to study the major indices each day. The major indices are the Dow Jones Industrial Average, the S&P 500 and the Nasdaq Composite Index. While the idea of following the market direction is important, I think the book does not give enough detail on how to spot a bear market, a market top, or how to spot short term and mid term corrections and bottoms. In order to do that, you will need to learn technical analysis skills yourself and supplement it with the knowledge in this book. They do offer you a market direction guidance, but you need to subscribe to their paid services to get it. Even so, I feel that it is lacking in precision that is needed for short and mid term trading. Well, perhaps if you follow the CAN SLIM method, you do not need to know about the short term and mid term bottoms and corrections. All you need to know is the long term bear market and bull market because after all, this book recommends that you buy stocks and hold them instead of trading them. The typical holding period I believe will be a minimum of 3 months to maybe a few years. If you find a super stock like Google or Microsoft then it could be decades. As mentioned earlier, the mindset of this book is more for investing in super growth stocks. Therefore, the methods and even the technical analysis are geared to spotting stocks for the long term. If you are interested in day trading, swing trading or any kind of trading then this book does not really help. But if you are into finding the next Facebook, Google and Apple and don't mind holding the stock for months and possibly years and decades, then this book is for you. The idea behind this book is to invest in stocks that changes the world and will grow and grow and grow. If the concept of buying today and selling it by next week excites you, then this is not the book for you. You will need to sign up for a trading course rather than an investing course. I believe that this book does a good job in giving its readers a well rounded and complete investing system. Note the word "investing". It's not trading my friends. This book tells you that each year or a few years, the stock market is dominated and lead by certain industry groups or sectors. For example, the late 90s were the years of internet stocks. Some years will be gold stocks. Some years will be bio stocks. The knowledge in this book will help you to capture the best stocks for theme plays in each year. Your job is to find a small handful of stocks and invest in them for as long as the theme is in play and get out before it crashes. I believe that the book itself is a true gem. They seek to educate the public on how to find the next great stock. But do remember that they are also in the business of selling products that help you invest better. Even after you have learned everything you can from the book, you might not know where to start to gather all the information needed to find those great stocks. This is where their financial newspaper "Investor's Business Daily" and their online website suite of tools called Investors.com come in. I must say that their service is top notch and the price is reasonable. I used to subscribe to them for about $29 a month. This is a small fee compared to the wealth of information and tools available to help you search for great stocks. However, I stop subscribing because I felt I prefer trading rather than investing. In the end it's really up to you to decide whether you need the extra services. If you are those who are into long term investing in growth stocks then by all means subscribe to their services. if you are still more interested in trading and technical analysis you should consider something else because their services are more for investing. So there you have it. An honest review about How To Make Money In Stocks : A Winning System In Good Times Or Bad. If you choose to buy this book and read it, I agree it is one of the best investing books out there. However, if you plan to trade stocks, then it may not be for you. Anyway, even if you are interested in trading, you will still find a ton of information in this book. Just get the book anyway, it costs very little to educate yourself.